Fill in your details below and we will let you know within 24 hours if we can get Pandemic: 10th Anniversary edition to you with haste! 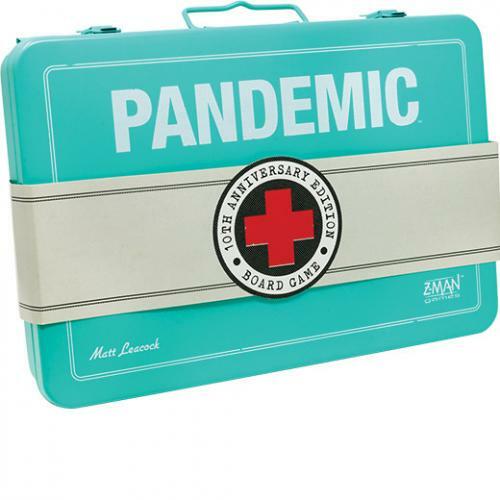 From designer Matt Leacock, Pandemic is a cooperative game of teamwork where an elite disease control team must keep four deadly diseases at bay. Each team member will have a specific ability. The Scientist, for example, only needs four cards of the same color to cure a disease, and the Quarantine Specialist can stop disease outbreaks in their city and the connected cities. With large ID cards and plastic figures, this special anniversary edition of the game will fully immerse you in your character's role to save humanity.